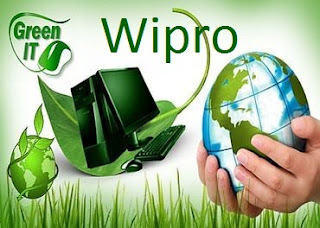 Wipro has topped the Greenpeace's Guide to Greener Electronics' listing its maiden appearance, surpassing Apple,Samsung, Dell,and Nokia among others. The wipro is the 1st company among the top 16 electronics company across the world based on thier commitment and progress in three environment criteria. : energy and climate, greener productsand sustainable operations. Wipro has scored the most points due to its efforts to embrace renewable energy and advocay for greener energy policies in India. Wipro also scored well for post consumer e-waste collection for recycling for facing out hazardous substances from its products. Wipro has set a new benchmark for sustainability, not only in India but across the globe, that will have a long term impact in shaping the green energy debate in the electronics industry. Here is the list of companies that are among top 10 green companies across the world. HP was the top company last year but this year it has dropped to 2nd rank. Nokia has moved up from 4th to 3rd. While most Information and communication Technology companies made progress in removing toxic chemicals from their manufacturing and supplying chains are still dependent on fossil fuels. Beside these companies also lag behind in effectively managing e-waste they produce, particularly in India. A massive global energy crisis is caused by polluting fossil fuels the next big environmental challenge for consumer electronics firms is to reduce the carbon pollution. The Indian company Wipro was the only company to reduce such toxic and harmful chemicals to a great extent and so the Indian Wipro has been top ranked among all Green Electronics companies across the world. You may also be interested in India's best employment caring companies, have look here.